Assam is in many ways a country of exceptional interest. Hemmed in by the sea on the south east and south west and by the lofty chain of the himalayas in the North the only route with which is connects with rest of the world lies to the North West and North East confines. 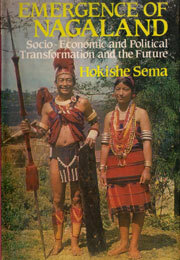 This book examines the history of Assam using available sources from earliest times to 1905. Most people from India are unaware of the people and problems of the North Eastern part. A part of this is the geographic isolation but a large reason is also because the tribal areas of that region were kept as a matter of policy were kept in isolation by the British governmet. Its high time that we get to know about the sterling qualities of these magnificent people. To this day the land of Assam contains many races of widely varying types and at widely differing stages of culture and the blod of its people is no douth a mixture of many diverse elemens. Its beautiful valleys have been a long a meeting place of Indian, Tibeto-Burman and Austric people. 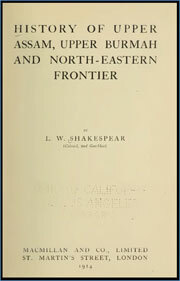 As I have found no book dealing completely and succinctly with Assam, its border land now so much in the public eye, and the many wild and interesting peoples dwelling along that border, which obliges the student to search through many books before arriving at the points of interest desired (if even then they are obtained), I have endeavoured to collect materials from all—to me—possible sources, and weaving them into narrative form, to produce something useful and readable at least for those who care about that little-known but very interesting corner of India. 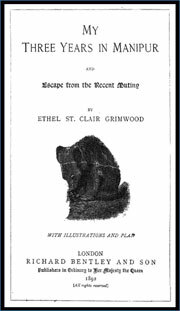 It is with some diffidence that I comply with Colonel Gurdon’s request that I should add a few words of preface and explanation to the last literary work of an old friend and pastor, whose loss will long be lamented in the Assam Valley, where he laboured as a missionary and planter’s chaplain for upwards of forty years. 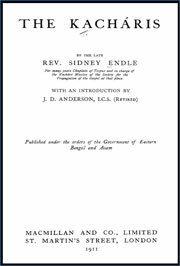 Mr. Endle’s interest in his Kachari flock was that of an evangelist rather than that of a linguist or ethnologist, and this preoccupation has coloured his style and affected the matter of his book in a way that, however pleasant and natural it may seem to those who had the privilege of his acquaintance, may perhaps require a few words of explanation for the benefit of those who look for anthropology only, or linguistics, in his pages. Joseph Héliodore Sagesse Vertu Garcin de Tassy (25 January 1794, Marseille – 2 September 1878) was a French orientalist.He studied under Silvestre de Sacy oriental languages and was awarded professorship for Indology at the School for Living Oriental Languages, that was founded for him. 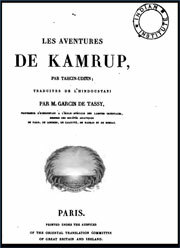 In 1838 he was elected to the Académie des Inscriptions et Belles-Lettres. and was one of the founders and later president of the Société Asiatique. Manipur ! How well I remember the first time I ever heard the name a name, too,which was comparatively unknown three short years ago, owing to the fact that it belongs to a remote little tract of country buried amongst hills and difficult of access, far away from civilized India, and, out of the beaten track. 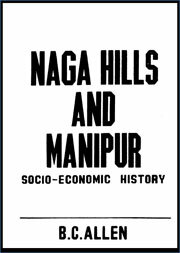 This is not a geographical treatise, and therefore there is no necessity three years in Manipur to dwell much on the exact whereabouts of a place which has already been described more than once. 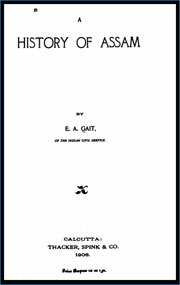 The Gazetteer of the Nags Hills district should only be regarded as a supplement to the monographs on the various Nags tribes, which are now under preparation by Mr. A. W. Davis, C.S. 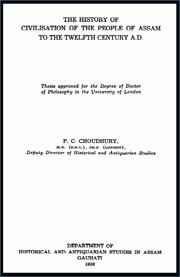 Similarly, much interesting information, which might under other circumstances have suitably been incorporated in this work, will be published separately in various monogrsphs on the Manipuris and the hill tribes subject to them, which are now engaging the attention of Mr. Hodson. It was in December, 1913, that 1 paid my visit for the first time to the historic and picturesque districts of Assam. I visited there the celebrated shrine of Kamakhya and the ancient places of Gauhati and Tezpur. Standing on the ruins of an ancient civilization and in the midst of a wild scenery which strikes the imagination by its beauty and grandeur I felt almost a fascination for the place. 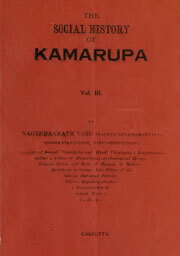 The historical materials which lay strewn all over the old Pragjyotishapur and other places not yet explored by scholars threw new lights on many obscure points of the past history and I felt a strong desire to undertake the compilation of a history of Assam on a somewhat elaborate scale. The first part of this book was pubHshed four years ago and in the Introduction I had given an outline of the plan to be followed in the second part. But I regret to say that the last four years have btten to me a period of great trial as owing to chronic nephrites and asthma attended with weakness of heart, I passed my time struggling between life and death, and had in consequence to give up some of the details that I had thought of working out in this part. 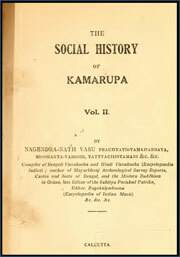 Has Kamarupa initiated Utkala or Utkala initiated Kamarupa ? My first reasoning forced me to think that probably Sankaradeva, the great religious reformer of Kamarupa went to Utkala and brought with him manners of singing kirtan from that country. 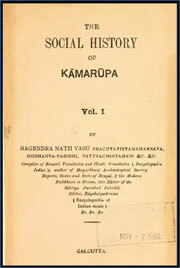 But after going through the Vaishnava literature of Utkala, I came to the conclusion that through the influence of Mahaprabhu Sri Chaitanyadeva, kirtan songs were introduced in Utkala ; that before Sri- Chaitanya, Sankardeva used to sing kirtans at Kamarupa and before his time kirtan songs were sung there.